Wilford Woodruff: At an early age my mind began to be exercised upon religious subjects, but I never made a profession of religion until 1830 when I was twenty-three years of age. I did not then join any church for the reason that I could not find a body of people, denomination, or church that had for its doctrine, faith, and practices those principles, ordinances, and gifts which constituted the gospel of Jesus Christ as taught by Him, and His apostles. Neither did I find anywhere the manifestations of the Holy Ghost with its attendant gifts and graces. When I conversed with the ministers of the various denominations or sects, they would always tell me that prophets, apostles, revelations, healing, etc., were given to establish Jesus Christ and His doctrine, but that they have ever since been done away with because no longer needed in the Church and Kingdom of God. Such a declaration I never could and never would believe. I did believe, however, that revelation, the gifts and graces, and the faith once delivered to the Saints a faith which they have enjoyed in all ages when God has had an acknowledged people on the earth could be done away with only through the disobedience and unbelief of the children of men. I believed every gift, office, and blessing to be just as necessary now to constitute the true Church of Christ and Kingdom of God as in any age of the world. This belief was firmly fixed upon my mind for two reasons: first, from the study of the Bible I found that the principle of cause and effect was the same in all ages, and that the divine promises made were to all generations. At the same time, I found no changes in the gospel in the days of Christ and the apostles, or that there would be any change in the plan of salvation in the last days. I learned also from the Scriptures that many of the ancient prophets, that Christ and His apostles foresaw by inspiration and revelation that the Gentile nations would apostatize and turn away from the true faith and from the Church and Kingdom of God as the Jews had anciently done; that there would be a falling away from, the apostolic faith, from, its doctrines and ordinances; that other systems would arise; that when these false systems should reach their fullness, the God of heaven would set up His Kingdom; that all angel would restore the gospel; and that it should be preached in all the world for a witness before the Savior should come to reign. I further believed that the gospel had been taken from the Jews and given to the Gentiles; that the Gentiles had, as foretold by the prophets, fallen into apostasy; and that in the last days Israel should be restored and the promises concerning that people should be fulfilled. All these things I learned from the Scriptures and they made a lasting impression upon my mind. The second reason for my peculiar belief in such principles, teachings, and doctrines was that in the days of my youth I was taught by an aged man named Robert Mason, who lived in Sainsbury, Connecticut. By many he was called a prophet; to my knowledge, many of his prophecies have been fulfilled. The sick were healed by him through the laying on of hands in the name of Jesus Christ, and devils were cast out. His son was a raving maniac. After praying and fasting for him nine days, he arose on the ninth day and commanded in the name of Jesus Christ the devil to come out of him. The devil obeyed and the boy was made whole from that very hour. This man instilled these principles into my mind as well as into the mind of my oldest brother Azmon. Father Mason did not claim that he had any authority to officiate in the ordinances of the gospel, nor did he believe that such authority existed on the earth. He did believe, however, that it was the privilege of any man who had faith in God to fast and pray for the healing of the sick by the laying on of hands. He believed it his right and the right of every honest-hearted man or woman to receive light and knowledge, visions, and revelations by the prayer of faith. He told me that the day was near when the Lord would establish His Church and Kingdom upon the earth with all its ancient gifts and blessings. He said that such a work would commence upon the earth before he died, but that he would not live to partake of its blessings. He said that I should live to do so, and that I should become a conspicuous actor in that kingdom. When Father Mason had finished relating the vision and its interpretation, he said, calling me by my Christian name: ‘Wilford, I shall never partake of this fruit in the flesh, but you will and you will become a conspicuous actor in the new kingdom.’ He then turned and left me. These were the last words he ever spoke to me upon the earth. To me this was a very striking circumstance. I had passed many days during a period of twenty years with this old Father Mason. He had never mentioned this vision to me before. On this occasion he said he felt impelled by the Spirit of the Lord to relate it to me. The vision was given to him about the year 1800. He related it to me in 1830, the spring in which the Church was organized. Three years later when I was baptized into the Church of Jesus Christ of Latter-day Saints, almost the first person I thought of was this prophet, Robert Mason. 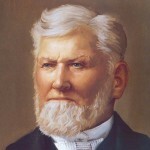 Upon my arrival in Missouri with Zion’s Camp, I wrote him a long letter in which I informed him that I had found the true gospel with all its blessings; that the authority of the Church of Christ had been restored to the earth as he had told me it would be; that I had received the ordinances of baptism and the laying on of hands; that I knew for myself that God had established through Joseph Smith, the Prophet, the Church of Christ upon the earth. He received my letter with great joy and had it read over to him many times. He handled it as he had handled the fruit in the vision. He was very aged and soon died without having the privilege of receiving the ordinances of the gospel at the hands of an elder of the Church. The first opportunity I had after the truth of baptism for the dead was revealed, I went forth and was baptized for him in the temple font at Nauvoo. He was a good man, a true prophet; for his prophecies have been fulfilled. There was so much reason in the teachings of this man, and such harmony between them and the prophecies and teachings of Christ and of the apostles and prophets of old, that I believed in them with all my heart. (Wilford Woodruff–His Life and Labors, p.14-15). This entry was posted in Apostasy, Church History, Friends, Visions. Bookmark the permalink.